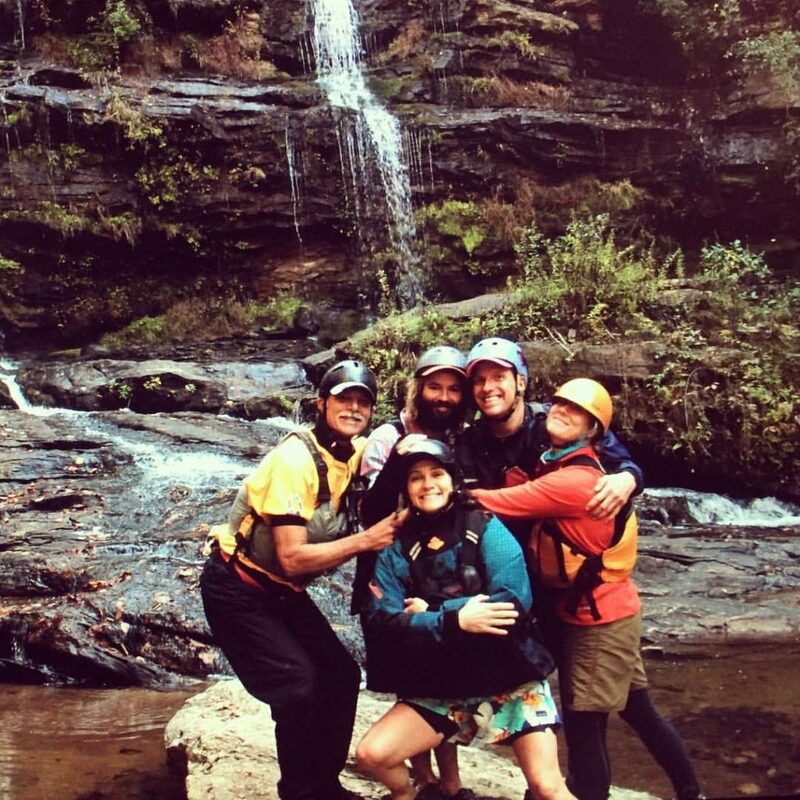 FROM THE BACK OF THE RAFT ~ 2016 Chattooga River Season in Review. by Taz Riggs | DBP MAGAZINE ONLINE The World's Best Free Whitewater Publication. 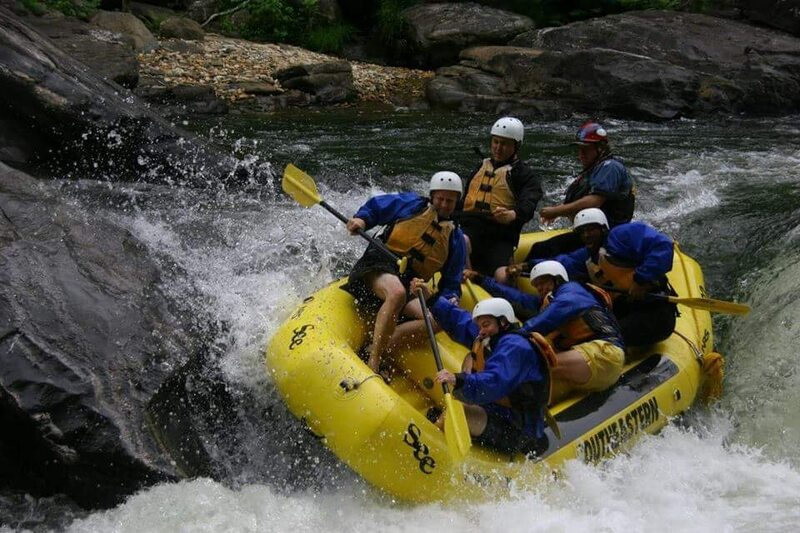 In January of 2016 the Chattooga River crested at 10 feet, approximately 25,000 cubic feet per second or more. Then again in early February the water rose to 7 feet, near 12,000 cfs. Sane people are satisfied to merely imagine huge logs hurtling downstream through the Five Falls or the Narrows, vaulting into holes formed by house sized boulders at summer flows. Debris was moved, removed and replaced. Evidence is still there at and below the new high water line, and just as much is entirely gone from memory. Later in the month a group of friends from Wisconsin and other places up north came south to find water that was not frozen over. We had our share. So, we put together a group of six two-man rafts and a couple of kayaks for a fun run on Section VI, from Woodall Shoals to Lake Tugaloo. The water level on the Highway 76 bridge read 2.5, which roughly translates to around 1,200 cfs, just above the cut-off level for commercial river trips on the same stretch of water, due to increased risk. 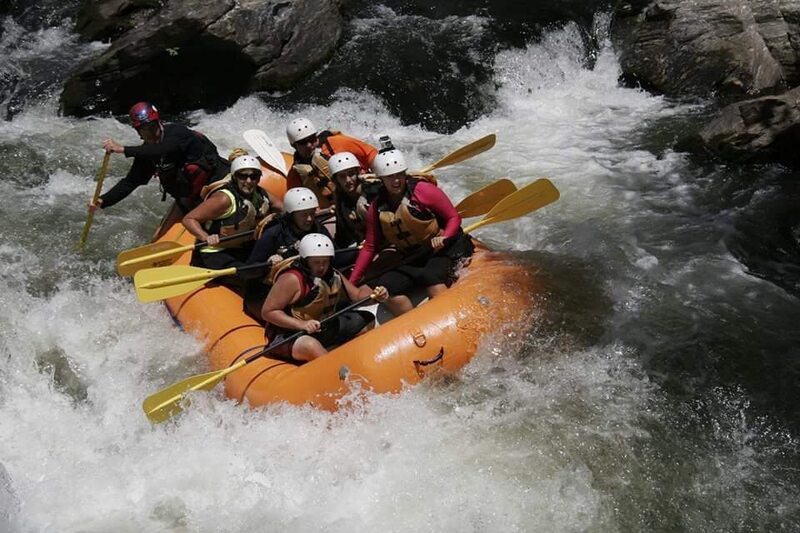 This was a strong group of river runners; almost half were tenured Chattooga river guides, the rest normally traveling the country in search of the next wet rush. 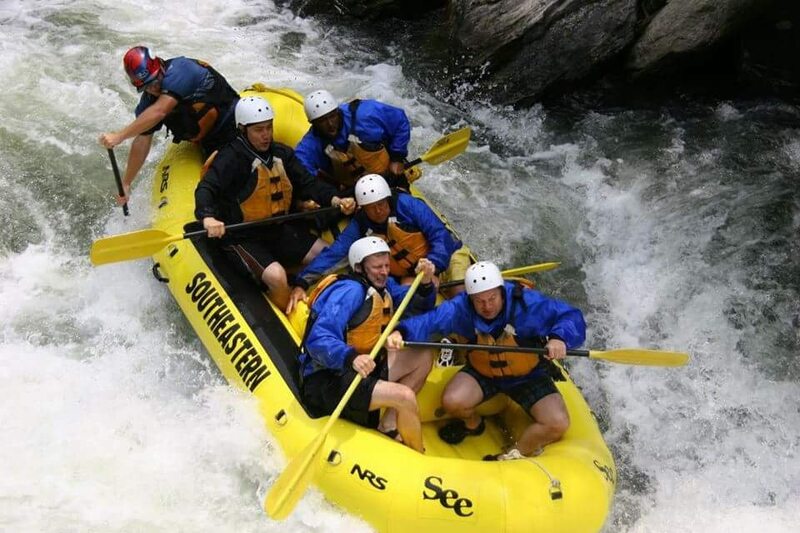 On the whole, the group lives the “lifestyle”; they eat, speak and breathe whitewater. Cold as it was to us Southerners, and for the rest as well, we moved pretty quickly downstream, boat scouting and hooting and howling below rapids when we would pause to cover for each other. To a Chattooga guide such as myself, this surely bode well for the coming rafting season: a quick run to see the Five Falls before the season, at max flows. After high flows of 7′ and 10′, the usual spring rains could keep us buoyant all year. 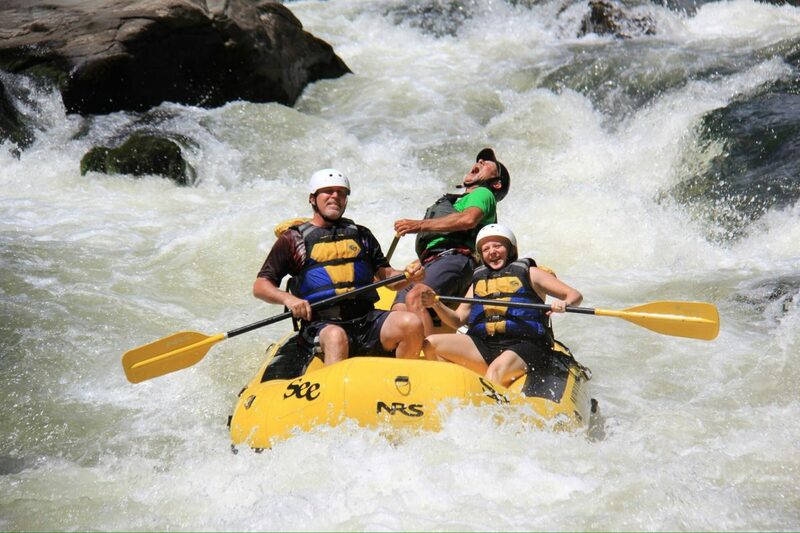 The 2016 rafting season on the Chattooga was typical. That is, by Chattooga standards. There is not much that is predictable about rainfall or the river’s flow throughout a season. The spring rains never really arrived. What we did get was scattered over our small watershed. An inch or so now and then was never enough to alter our itineraries; any increases in flow were temporary and couldn’t help in the long run. 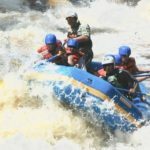 Normally at higher levels we can shift trips to access points higher along the river in order provide a trip of somewhat equal duration and difficulty of rapids without increasing risk to clients. By the third week in June the steady decline was undeniable, as the gauge slipped beneath 1′ (110cfs). Then, by the fourth week in September, it read 7′ (45cfs?). I shouldn’t forget though, that on the night of August 3-4, we received around 5 inches of rain as measured at different locations around the watershed. By the time river companies made decisions as to where to launch trips the river level was at 2.4 and assumed to be rising. The rate that it would be rising would be unpredictable, let alone that it might rise any more. Even with quickly obtainable on-line information, complete with graphs and all, the stats are not real time and aren’t synced with what outfitters have used for decades as a standard. (In fact, even though a large concrete bridge was carefully removed and replaced, a stub of the old bridge piling still exists with the supposed original river gauge attached.) In spite of all the technology and to some extent because of it’s availability, we are cautious to make predictions about when, from where and how much water is gathering above. I also inform them that I really don’t like to use the word “low”. Low sounds negative. The only thing that could provide more consistency would be more reliable rains or a dam upstream. Rain would certainly be a plus, a dam would not. So much would change. For one, the small pretty beaches, that sparkle in the sun like stars in the night sky, would disappear. The aquatic habitat would change and a chain reaction begin. Dozens and dozens of creatures and plants would be affected directly and indirectly. At the same time, although the river corridor is protected by a 1/4 mile buffer, much of the remaining land within the watershed could still be developed for it’s resources, i.e.- logging, minerals, private development. As we should all know well by now, the river and the land surrounding it are one and the same. We need the high water and the occasional flood to clear the river, as the forest to some extent naturally progresses and matures. Most guests are surprised to find out that the trees around us are actually quite young, at around 60 or 70 years old. The entire area has been logged over more than once. There is but only a few patches of old growth trees within the boundaries of the river’s water. If the area had not been forested the trees would have massive trunks standing more than a hundred feet tall with huge canopies of leaves blocking the light from the spacious forest floor, where undergrowth would have been minimal except along the river’s edge. The ground would consist of a thick, loamy, almost sponge-like floor, many feet thick, made of decaying leaves and other matter. The force of a rainstorm could be more easily absorbed and more slowly released over a longer period of time. There is and always will be a somewhat natural succession in the woods. Plants must compete for space and for food. While at the same time some plants are under threat by “un-natural” causes; Fungi of all kinds, microbes, non-native grasses, Kudzu Vine and now an insect known as the Hemlock Woolly Adelgid, an aphid like creature that is decimating the American Hemlock population. Scientists are concerned that the species will disappear faster than the American Chestnut tree, which once represented over 50% of the Appalachian forests. One infected hemlock along the river, nearly denuded of it’s tiny pine-like leaves, at 18′ in diameter, simply cracked in half, fell across the top of a twenty foot tall boulder and shattered the trunk into five or six pieces, littering and temporarily blocking the width of the river. There were several Oaks and one Hickory that will probably survive in some odd shape. Most of these caused merely temporary irritation as potential hazards. There was that one big Oak below what we call “Dead Cow Beach”; we had to physically pick up our boats to get past it. What made it so unique was that it had amazing clusters of acorns that may have weighed up to twenty pounds, hundreds and thousands of nuts. Drought? Disease? Some sort of infestation? A combination of these? The tree definitely took one last gasp and heave, producing a hopeful crop of saplings or food for animals. There is always reason to hope. Just the fact that a river of this quality exists within easy striking distance of several metropolitan cities is cause to celebrate. The Chattooga enjoys a good measure of protection that, in spite of challenges, continues to expand, improve and move forward. Not a day goes by out here that you can’t admire some uniqueness of the place. Blue Heron, Osprey, Hawks, Ravens, and Pileated Woodpeckers are not uncommon, and an occasional Bald Eagle sighting down on the lake is no longer doubted. If I can get folks to look carefully, they can quickly describe four or five distinctly different fish, often easily more. With over 70 varieties of fish, it might be impossible to see them all, unless that was your mission. I had the good fortune to witness a species of fish that was new to me. The Red Horse Suckerfish performs it’s mating rituals in the early summer, in swarms at the base of the taller and stronger rapids. They have large dark red edged scales that remind me of a Carp, but they’re slender and swim more like eels, showing a flash of their bony foreheads. They didn’t seem to be trying to mount the rapid, but swam in tight rolling, boiling masses, twisting around and over each other. There they were. They had always been there on the bottom and they had just now come to my attention and curiosity. Snakes?… Sure we got snakes. Like rocks in the river, you meet them often enough; they end up with names and should be avoided. There was J.J. (Jawbone Joe), a Copperhead that stood his turf within a small range, right where we would pause our guests to reload after portaging Crack-In-the-Rock. Someone would need to check for his whereabouts daily, just to make sure we didn’t get in his way. There was Chin-Chin, a small Banded Water snake, that fit so neatly in his home crack at Raven’s Chute Rapid where we would stop to swim through the Pot Hole there with our people. All that we ever saw of him was his amused little grin, marked by his yellow jaw and chin. People climbed out of the water right in front of his nose and didn’t know it. I figured if the snake was not in a panic, there was no need for anyone else to fuss. After being assured that he was in fact harmless, most people could not resist smiling back at him. We seemed to be able to tolerate them on the river in the light of day, but we had two Copperhead bites around our housing area. One was no more than an irritation, the other put a guide off the river and on crutches for two weeks. It doesn’t help that two of us are convinced (I’m one) that the eyes of a big cat glowed in our headlamps not twenty or thirty feet from us in different locations around the same time at night. Around twilight one evening, one of the guides bent to pick up a stick to toss for a dog that turned out to be a good sized Black Bear. Then, every once in awhile, one of those displaced Armadillo runs over your toes in the dark, sending you ten feet through the air. Funny how we are so cavalier around our guests in the light of day and such stick wielding high-beam shooting warriors at night. Our resident big owl gets a big hoot out of us. Some time after switching to the Forest Service Operation- Plan B (Low Water Contingency), people stopped checking the gage. At .7 the river is less than 50cfs. Pushing and pulling accounts for more of your physical day than actual paddling. We stop talking about it and it really is astounding that we can turn it into a blend of science and side-show, tilting our rafts up on one tube to squeak through slots, bouncing and spinning off of rocks like balls in a Pin-Ball Machine. No matter, it’s still fun. The only other way to come close to the experience would be to do a lot of hiking, which has it’s own set of drawbacks. If there was any consolation, there seemed to be a lot less Deer and Horse Flies this year. Guides always refer to the “Secret Season.” That is, either the Spring or Fall, those times of year when the area shows it’s greatest changes. Spring rains can bring high water, as can Hurricane season in the Fall. Ironically, the folks who would like to see more water in the river in the summer, wouldn’t want to be here in the rain or the possible cold. As it turned out, we stayed above that .7 thresh-hold till after Labor Day. The volume in the river dropped more slowly and seemed to stabilize with the coming of peak leaf colors. The temperatures of both Spring and Fall were quite mild, and it seemed such a shame not to have folks here to share it with. The light is lower in the sky and softer showing off the contrasts in colors. I can easily be hypnotized by the leaves swirling by on different levels and different speeds on different threads of current that put them on separate loops and arcs. The Spring brings wildflowers and the songs of returning birds as well as an explosion of bright green leaves after a winter of grey. It’s really not a secret, except that I have to tell you that it’s so. Don’t take my word, come and see. We finished our last trip of the season this past Saturday. Point Five Eight. The lowest level of the year, The trip was conducted with a bit of celebration and a bit of sadness for the break of a few months. It really takes a measure of devotion and a good bit of affection for it all. Many could choose to travel and work on other rivers; more consistent volume and predictable lines…day after day; more hustle, more easy access for more people…crowds. And, no Secret Season. 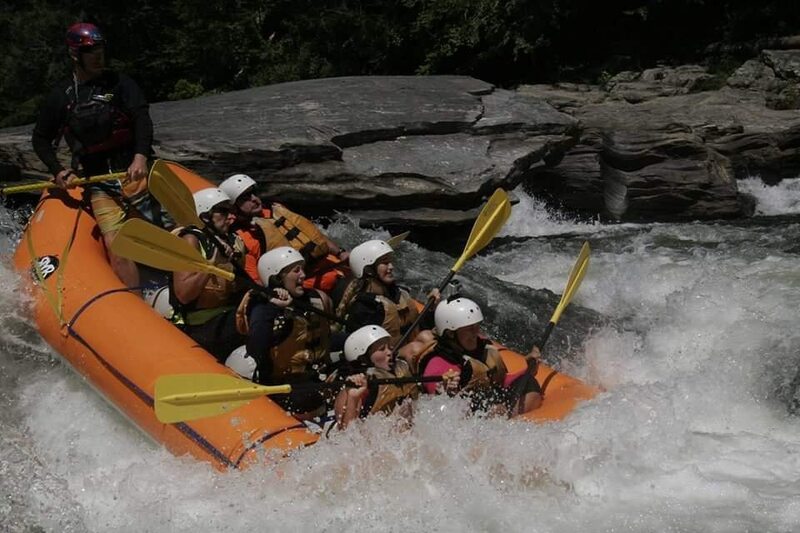 GAULEY FEST 2016 ~ Paddlin’ The Upper & Partyin’ with Purpose. by Michael Potter, Joe Mayer, F Wes Breitenbach, and Mike Toughill.